Southern Han (Chinese :南漢; pinyin :Nán Hàn; 917–971), originally Great Yue (Chinese :大越), was one of the ten kingdoms that existed during the Five Dynasties and Ten Kingdoms period. It was located on China's southern coast, controlling modern Guangdong and Guangxi. The kingdom greatly expanded its capital Xingwang Fu (Chinese :興王府; pinyin :Xìngwángfǔ, (present-day Guangzhou). It attempted but failed to annex the Tang province of Annam (modern northern Vietnam). The Old History of the Five Dynasties was an official history of the Five Dynasties (907–960), which controlled much of northern China. It was compiled by the Song Dynasty official-scholar Xue Juzheng in the first two decades of the Song Dynasty, which was founded in 960. It is one of the Twenty-Four Histories recognized through Chinese history. The New Book of Tang, generally translated as "New History of the Tang", or "New Tang History", is a work of official history covering the Tang dynasty in ten volumes and 225 chapters. The work was compiled by a team of scholars of the Song dynasty, led by Ouyang Xiu and Song Qi. Shangcai County is a county in the south of Henan province, China. It is under the administration of Zhumadian City. Hanzhong is a prefecture-level city in the southwest of Shaanxi province, China, bordering the provinces of Sichuan to the south and Gansu to the west. Wenshan Zhuang and Miao Autonomous Prefecture is an autonomous prefecture in southeastern Yunnan province, People's Republic of China, and the easternmost prefecture-level division of the province. It borders Baise, Guangxi to the east, Vietnam's Hà Giang Province to the south for 438 kilometres (272 mi), Honghe Hani and Yi Autonomous Prefecture to the west, and Qujing to the north. The Teochew people are a Chinese people native to the historical Chaozhou prefecture of eastern Guangdong province who speak the Teochew dialect. Today, most Teochew people live outside China in Southeast Asia, especially in Singapore, Malaysia, Thailand, Cambodia, Vietnam, Philippines, and Indonesia. They can also be found almost anywhere in the world, including North America, Australia and France. 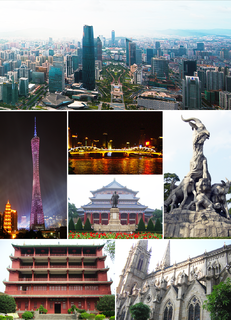 Luogang District is a former district of Guangzhou, the capital of Guangdong province, China. It was merged into Huangpu District on 12 February 2014. Liu Chang, originally Liu Jixing (劉繼興), was the fourth, last and youngest Chinese emperor of Southern Han during the Five Dynasties and Ten Kingdoms period, reigning from 958 until his country was annexed by the Song dynasty in 971. Palaung, or in Chinese De'ang, is a Mon–Khmer dialect cluster spoken by over half a million people in Burma and neighboring countries. The Palaung people are divided into Palé, Rumai, and Shwe, and each of these has their own language. The Riang languages are reported to be unintelligible or only understood with great difficulty by native speakers of the other Palaung languages. Ji or Jicheng was an ancient city in northern China, which has become the longest continuously inhabited section of modern Beijing. Historical mention of Ji dates to the founding of the Zhou Dynasty in about 1045 BC. Archaeological finds in southwestern Beijing where Ji was believed to be located date to the Spring and Autumn period. The city of Ji served as the capital of the ancient states of Ji and Yan until the unification of China by the Qin Dynasty in 221 BC. Thereafter, the city was a prefectural capital for Youzhou through the Han Dynasty, Three Kingdoms, Western Jin Dynasty, Sixteen Kingdoms, Northern Dynasties, and Sui Dynasty. With the creation of a Jizhou (蓟州) during the Tang Dynasty in what is now Tianjin Municipality, the city of Ji took on the name Youzhou. Youzhou was one of the Sixteen Prefectures ceded to the Khitans during the Five Dynasties. The city then became the southern capital of the Liao Dynasty and then main capital of the Jin Dynasty (1115-1234). In the 13th Century, Kublai Khan built a new capital city for the Yuan Dynasty adjacent to Ji to the north. The old city of Ji became a suburb to Dadu. In the Ming Dynasty, the old and new cities were merged by Beijing's Ming-era city wall. "The Legend of Wenlong" is an ancient folk story of Han Chinese origin, that was early on adopted by several people groups in Southern China including the Zhuang. It is also known by the name of the associated Chinese opera Liu Wenlong and the Water-chestnut Mirror. It is now a traditional song of the Zhuang people that is sung at the Dragon Boat Festival in some places. Liu Sifen is a Chinese novelist and painter who was the president of Guangdong Literature and Art Association. The 2014 Guangzhou Evergrande season is the 61st year in Guangzhou Evergrande's existence and is its 47th season in the Chinese football league, also its 25th season in the top flight. Guangzhou Korea School is a South Korean international school within the Jinxiuxiangjiang Primary School (锦绣香江小学) located within the Jinxiuxiangjiang Apartment (绣香江小区) in Nancun Town (南村镇), Panyu District, Guangzhou. The 2016 Guangzhou Evergrande Taobao season was the 63rd year in Guangzhou Evergrande's existence and was its 49th season in the Chinese football league, also its 27th season in the top flight. The Legend of Five Goats comes from the ancient Guangzhou city, and is an origin of Guangzhou's nicknames like 'City of Five Goats', 'City of the Goat', 'City of the Rice'. It is also the origin of many Guangzhou local brands' names. The name 'Five Goats' can earliest be seen in poetry of Tang dynasty, and the related legendry can be dated back to Jin dynasty. Though the legendary had several versions, it was unified after Ming dynasty. Usually the Legend of Five Goats reflects the history that Lingnan people was colonized by Zhongyuan ancestors. In 2007, this legend was collected into the first batch of The Masterpieces of the Oral and Intangible Heritage of Humanity of Guangzhou. The Ziqi Kingdom was a kingdom established by Wuman in southwestern China during the Song dynasty. 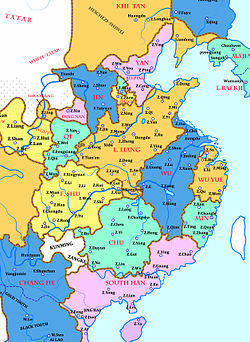 The territory of the Ziqi Kingdom included parts of modern-day Guizhou, Guangxi and Yunnan provinces of China. 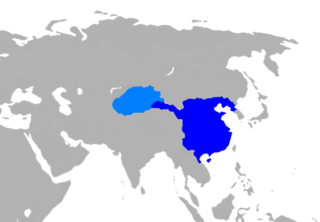 Shehua is an unclassified Sinitic language spoken by the She people of southeastern China. It is also called Shanha 山哈 (San-hak) or Shanhahua 山哈话. Shehua speakers are located mainly in Fujian and Zhejiang provinces of southeastern China, with smaller numbers of speakers in a few locations of Jiangxi, Guangdong, and Anhui provinces. Han Eight Banners, were one of the three divisions in the Eight Banners of Qing dynasty. At beginning, members of Han Eight Banners had used to be Han Chinese living in Ming dynasty. During the transition from Ming to Qing, these people were conquered by Jurchen people or surrender to them. In 1631, Hong Taiji started the Han Army of Eight Banners. Then some other Han people who had surrendered to Qing dynasty joined Han Army of Eight Banners. ↑ Schottenhammer, Angela (2015). "CHINA'S GATE TO THE SOUTH: IRANIAN AND ARAB MERCHANT NETWORKS IN GUANGZHOU DURING THE TANG-SONG TRANSITION (c.750–1050), PART II: 900–c.1050" (PDF). AAS WORKING PAPERS IN SOCIAL ANTHROPOLOGY. Wien: Austrian Academy of Sciences. 29: 1–28. doi:10.1553/wpsa29. ISBN 978-3-7001-7880-4. (webpage). ↑ Miles, Steven B. (June 2002). "Rewriting the Southern Han (917-971): The Production of Local Culture in Nineteenth-Century Guangzhou". Harvard Journal of Asiatic Studies. Harvard-Yenching Institute. 62 (1): 45. doi:10.2307/4126584. JSTOR 4126584. ↑ 李, 庆新. "南汉对外关系与海外贸易". 中国经济史论坛. ↑ 李, 庆新 (2010-11-04). "南汉对外关系与海外贸易". 中国经济史论坛_ 国学网. ↑ 周, 加胜 (2008). 南汉国研究 (博士 PhD). 陕西师范大学. ↑ 崔, 北京 (2006). 南汉史研究 (硕士 Masters). 陕西师范大学. (page link).